They had before & after the race pics up on twitter, I felt soooo sorry for her grooms. 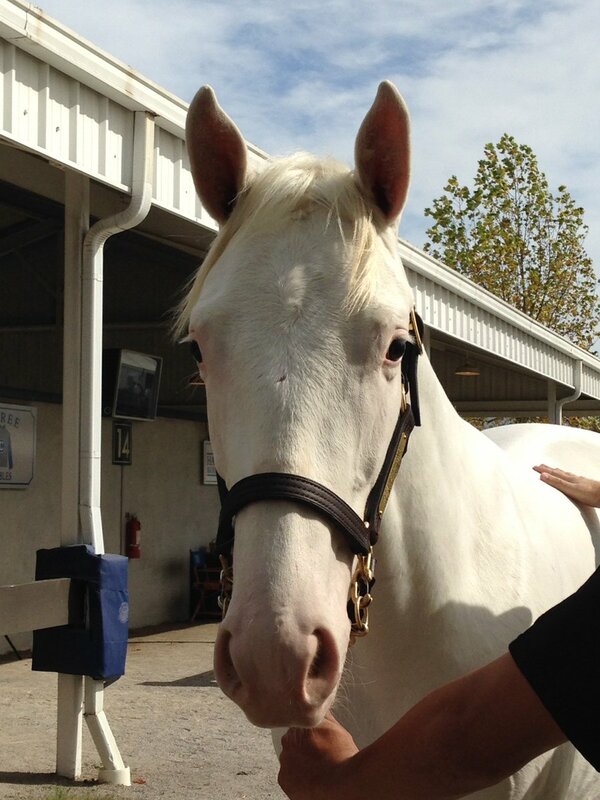 She was pristine cloud-white in the parading ring and so muddy she looked fleabit grey after running. I saw that race and I'm glad someone has posted a photo of the colt. His coat is so golden and his mane and tail so flaxen that IMHO he could be registered as a palomino. BaroqueAgain1 wrote: I saw that race and I'm glad someone has posted a photo of the colt. His coat is so golden and his mane and tail so flaxen that IMHO he could be registered as a palomino. He sure does look like a Palomino. Very good looking horse. 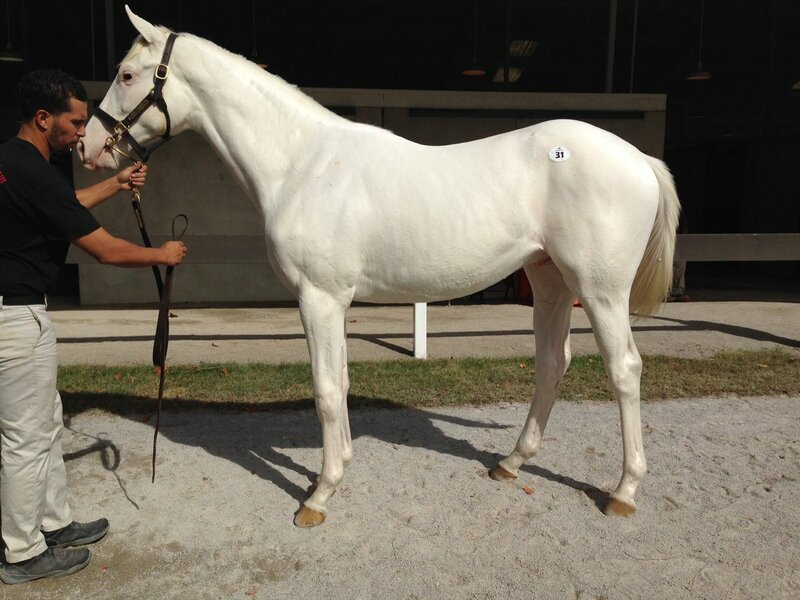 Hip 31 at #FTOct is a horse of a different color: A white Get Stormy colt. His hind legs look really straight in that side shot. Maybe he'll make someone a flashy saddle horse, but I would be surprised if he's a successful racehorse. I hope I'm wrong, because I have a soft spot for Clyde (Get Stormy). Sparrow Castle wrote: Wonderful win for Shironii! He sure is easy to pick out in the race. 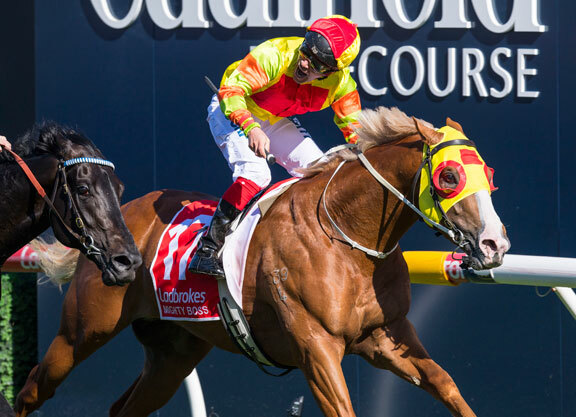 Miss Vista, the splash white, finished 3rd in her race at Caulfield today. Haven't found a replay but in Googling for the results (grrr, TVG didn't show it), I found a Facebook page with more photos of her. I caught Miss Vista on Australian racing last night at Seymour...she led for about 4 furlongs of a 5 furlong race and then was "swallowed up" by the closers. In checking her recent record I noticed she hasn't been doing well after coming back from a break. Perhaps retirement will be in her future? BaroqueAgain1 wrote: His hind legs look really straight in that side shot. The stance and angle of the photo makes them look worse than they are. But as it were an article on Bloodhorse implied that the person who bought him was likely just a collector and wasn't sure if he'd race him or just keep him as a nice flashy hunter for his daughter. This is the DRF article about his sale. I thought it was interesting, especially how they keep the tail white...wish they'd name the shampoo. Since 2002, the North American auction market has seen just eight registered white Thoroughbreds go through the ring during the yearling season. The number of eventual Kentucky Derby winners offered in the same span of time is seven. The newest member of the exclusive club of white auction graduates was Blizzard Condition, a completely unmarked Get Stormy colt who sold to Becky Thomas as agent for David Hutson for $21,000 on Monday at the Fasig-Tipton Kentucky fall yearling sale. I think that is 4 white foals in a row for her. It would be great if she could get a top class runner because she isn't bred for color and she has been going to G1 winning stallions. Wonder who she will go to this season. 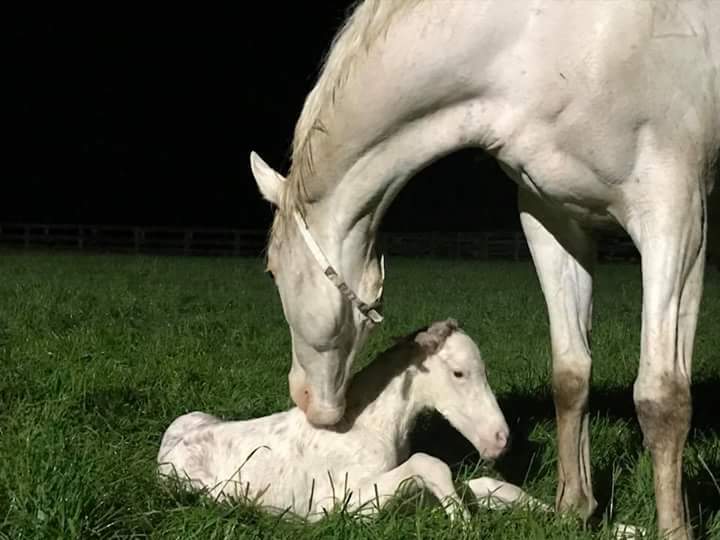 ETA: I'm curious by the way, is it easy for Aussie mares to go to studs in NZ and Kiwi mares to go to studs in Australia? Or do their quarantine restrictions for the rest of the world apply to one another? 2013:unnamed Chestnut Colt by Pluck-I havent found anything about this foal except that he was sent to NZ in 2013 with his dam. Sunline (1995-2009)- Queen of the Turf/ Mare of the World. Godolphin's loudly marked Talismanic will be running in next weekend's BC Turf. 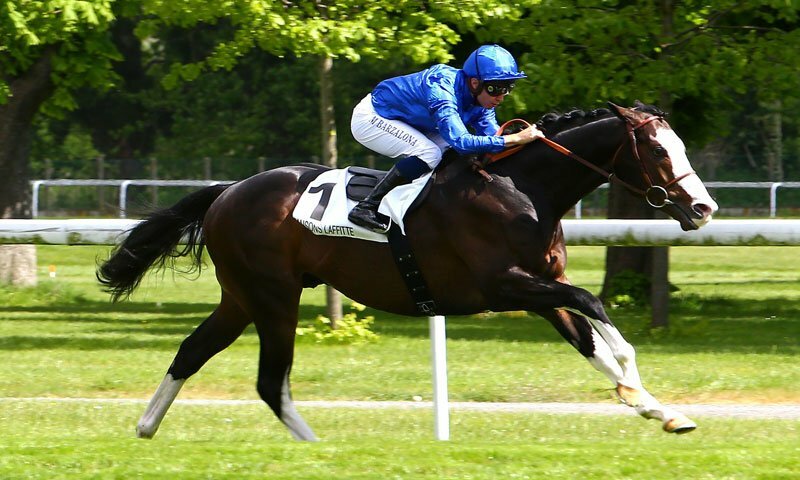 Starine wrote: Godolphin's loudly marked Talismanic will be running in next weekend's BC Turf. He has a belly spot but I can never remember on which side. First caught my eye in last year's Arc paddock. 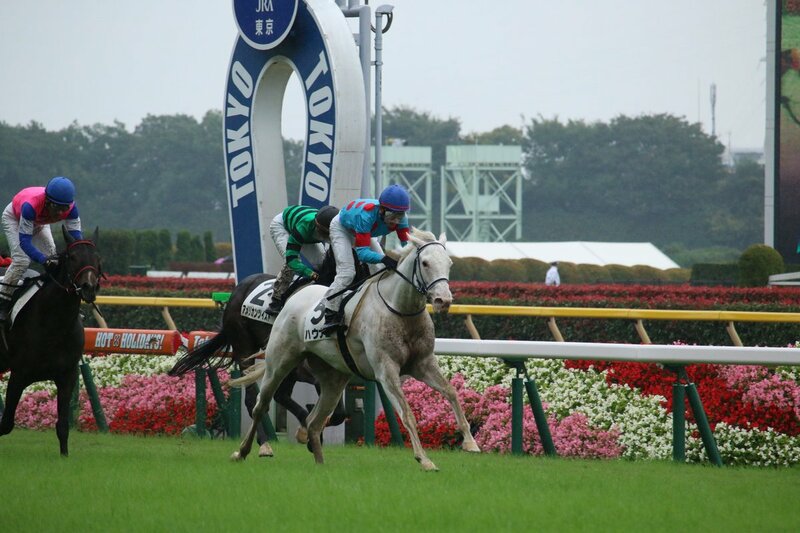 Shironii (JPN), full brother to Buchiko (JPN), got his third win today at Kyoto going 1800m on the dirt. lurkey mclurker wrote: Shironii (JPN), full brother to Buchiko (JPN), got his third win today at Kyoto going 1800m on the dirt. I saw that race on the Kyoto feed...wonderful come from behind victory with this guy. I don't have his pp's...have they tried him in Group stakes company yet?